Bitcoin is acting up at the moment. Following a steep decline that saw the currency trade at prices not seen since late November, trading of Bitcoin on the Mt.Gox exchange has gone crackerdog. 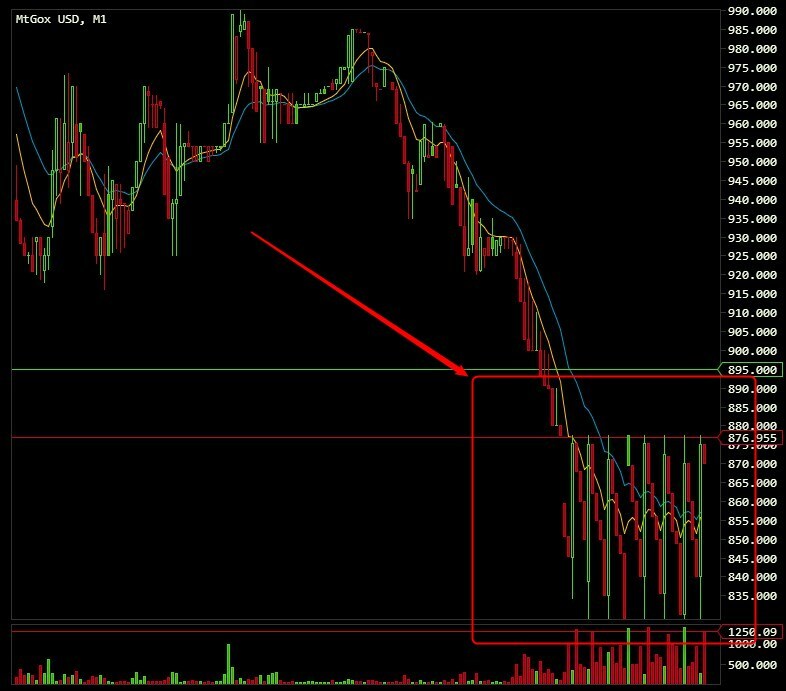 Trading on Mt.Gox is also seeing massive delays, with the current lag listed as almost 40 minutes. So, I doubt that anyone has an idea about what is going on. Other Bitcoin exchanges, such as Btc-e are displaying similar prices for the currency, so the trading price on Mt.Gox isn’t itself too batty. Instead, current trading patterns themselves are inscrutable, unless we presume some sort of algorithmic allergic reaction to current trading lag. In the meantime, if you can get your trades through, there is likely a decent arbitrage possibility at play, though trading lag times could make any such activity incredibly risky. Coinbase has Bitcoin at $848, and Btc-e at $865. The currency was over the $1,000 mark yesterday. Bitcoin: Still not that mature. While Bitcoin works through whatever bug or issue is causing its current trading pattern, we need to keep in mind the broader context of the current market position of the currency. A recent decision by the Chinese government to ban financial institutions from trading in the currency cut at its potential to become a global repository for value outside of the control of nation states. Today, news that Baidu has ceased to accept Bitcoin is pushing the currency’s value down. To lose a company like Baidu at once lowers the inherent utility of Bitcoin, and also directly contravenes the narrative that Bitcoin was starting to find wide integration into the world of e-commerce, thus granting it legitimacy, and perhaps improved stability. Chinese demand has been a key supplier of recently robust demand for Bitcoin, comprising an increasing percentage of Bitcoin’s trading volume. If that driver slips, so too could the value, and market interest in Bitcoin. Bitcoin has fallen from over $1,200 since the Chinese news cycle broke. That’s a steep decline — about 30 percent — in a few days. The question now becomes what will bring upside back to Bitcoin?